Ever since the Rs. 11,300 cr fraud at Punjab National Bank (PNB) – the country’s second largest government lender, was detected, new allegations and counter allegations flew thick and fast between India’s two main political parties. The ruling Bharatiya Janata Party (BJP) came under fire from the Congress who claimed a whistleblower named Hari Prasad had written to the Prime Minister’s Office (PMO) on July 29, 2016 raising an alarm about alleged irregularities between Mehul Choksi’s firm and several banks. Congress spokesperson Randeep Surjewala alleged that nothing was done despite the matter being brought to the PMO and Registrar of Companies notice. The Congress, still smarting under the attack by Prime Minister Narendra Modi last week in Parliament where the PM called rising NPAs (Non Performing Assets) as “sins of the Congress regime”, cheekily called the accused Nirav Modi as ‘Chhota Modi’. But who was this whistleblower Hari Prasad? And did he provide details to the PMO about the fraud at PNB? The letter posted by Congress handle @INCSandesh tweeted a detailed account of his allegations against Geetanjali Gems Chairman and Managing Director Mehul Choksi. In the letter Hari Prasad accuses Choksi of ‘managing the banks’ and taking loans to the tune of Rs. 9872 crores while its assets were only Rs. 25-30 crores. Hari Prasad expressed fears that these loans could become NPAs very soon and an investigation should be done in the company’s credit report with the banks. News agency ANI tweeted attributing to sources that the key accused in the case Nirav Modi, his wife Ami Nirav Modi, Nishal Modi and Mehul Choksi had left the country in the first two weeks of January this year. CPI(M) leader Sitaram Yechury tweeted an image dated January 23, 2018 of Nirav Modi along with the Indian trade delegation and Prime Minister Narendra Modi at the World Economic Forum (WEF) at Davos, Switzerland. This year the WEF was held at Davos between January 23-26 while the complaint by the bank was filed on January 29 which resulted in the Central Bureau of Investigation (CBI) filing an FIR on January 31. Meanwhile, journalists have put out different versions on whether any meeting between the businessman Modi brothers and Prime Minister Narendra Modi took place at Davos. Senior journalist Swati Chaturvedi tweeted attributing to sources that the Modi brothers had a ‘privileged private meeting’ with PM Modi at Davos. Breaking my sources tell me that #NiravModi & his brother had a privileged private meeting with @narendramodi in Davos! While Outlook also attributing to sources said that no such meeting took place. “No official business delegation travelled with PM Modi. There was no meeting between Nirav Modi and PM Narendra Modi in Davos, it was just a photo opportunity at an event,” said sources to Outlook. 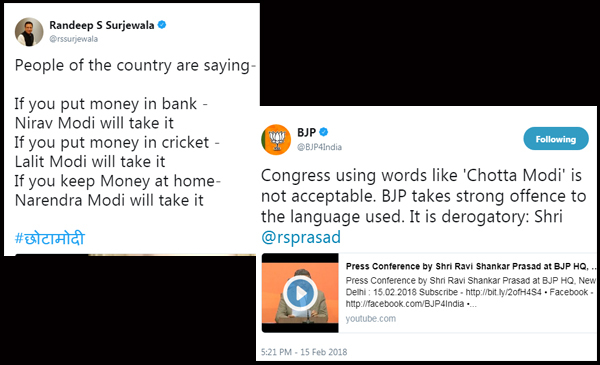 The BJP also went on an overdrive hitting out against the Congress on Twitter and a press conference was addressed by Union Minister Ravi Shankar Prasad. The senior BJP leader lashed out against the Congress taking strong offence to the reference of ‘Chhota Modi’ and also calling it derogatory. Prasad denied Nirav Modi was part of the PM’s delegation and said he was present at Davos as part of the CII delegation. Prasad also said assets worth Rs. 1300 crore have been seized and the passports of the accused revoked, along with circulating a look-out-notice for Nirav Modi. But it was not just the reference to Nirav Modi that kept both the parties occupied. The rivals were also gunning for each other pitching the blame on each other for the fraud. The day also witnessed hectic action on the part of the Enforcement Directorate who seized diamonds, jewellery and gold worth Rs. 5100 cr during searches across Modi’s showrooms, residence and offices in Mumbai, Surat and Delhi, according to an agency report. The premises included Modi’s residence in Kurla (Mumbai), his jewellery showroom in Kala Ghoda, three company locations in Bandra and Lower Parel, three premises in Surat in Gujarat and showrooms in Chanakyapuri and Defence Colony in Delhi.